It's September, and if it's September, you can bet I've been working on a giant, complicated costume. 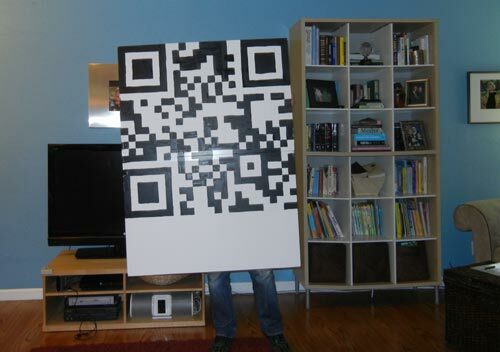 But when I realized I could make a QR costume with just a giant white board and black paint, I had to try it. 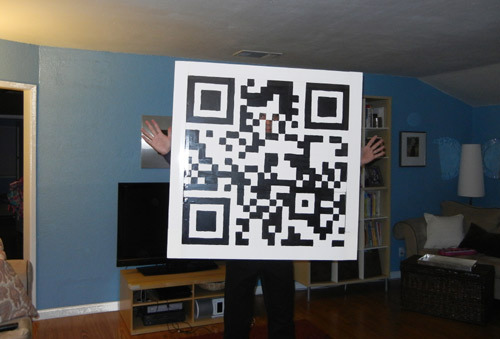 There are plenty of great QR code generators on the web. I used one at the ZXing project. I tried a few different codes until I found one that had something like a face on it. 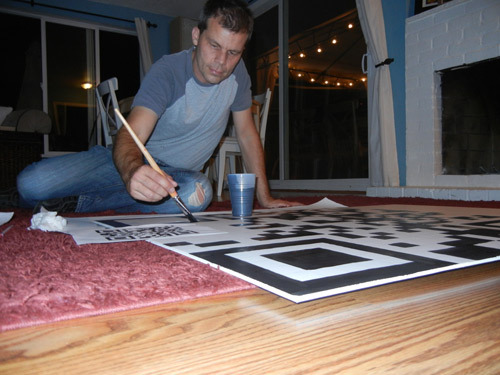 QR codes come in a variety of sizes, but I wanted a very simple one, to reduce the amount of work I'd have to do to blow it up to man-size. I settled on a 25 x 25 grid. 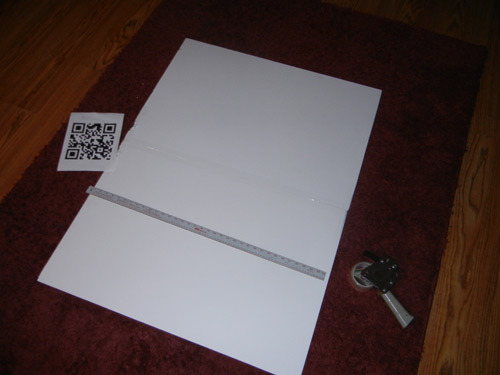 I used a large sheet of waterproof foam board and outlined the grid in pencil. 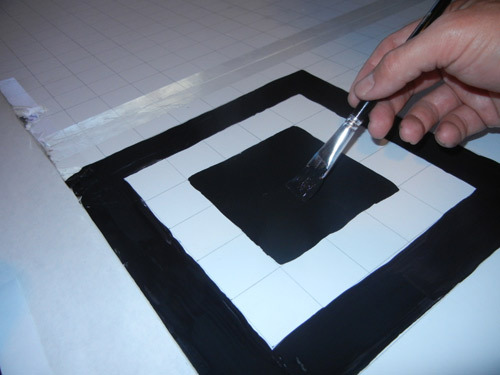 I considered using black duct tape, or masking off areas, but I figured it would be easier to just paint the black areas with a brush. Painting the squares took about an hour and a half. 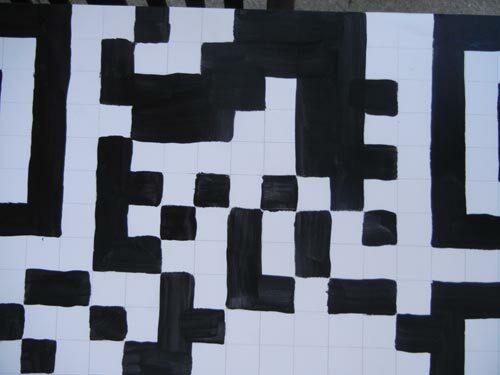 For a cleaner look, I could have painted the white squares too. Unfortunately, when I finished the board, it didn't work! The updated version of RedLaser for the iphone wasn't responding at all to the code. Crap! Did I miss a square? Was it just too large? Was my painting technique too crude? Were the pencil gridlines screwing up the read? I wasn't sure, but I figured I'd let the paint dry overnight and see what the next day would bring. The next day brought junk mail. 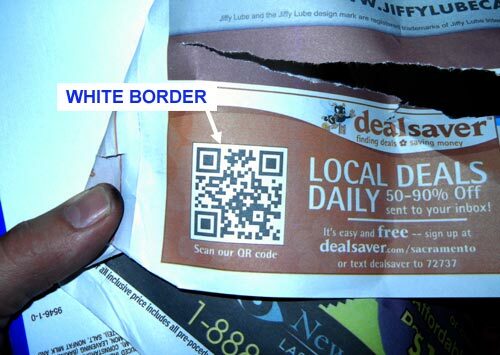 And on that junk mail were QR codes. This ad caught my eye. The QR code was on a red background... and it had a white border. That's what I needed to change. I sliced some foamcore board in the backyard and added a clean white border all the way around the code. It looked awesome, and the very first test confirmeed by suspicions. The white border made the difference! 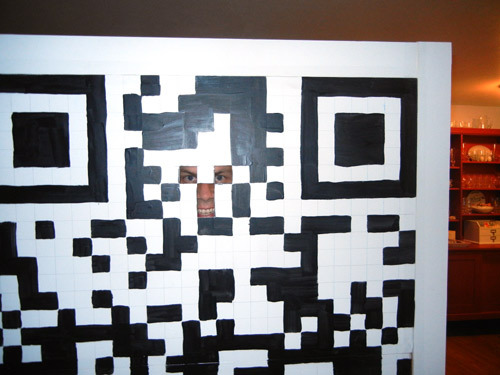 I could scan it! 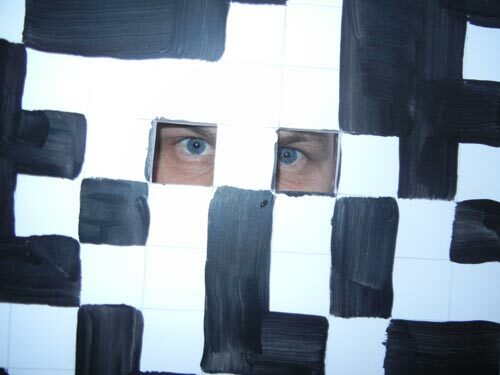 Next I cut a couple of squares for eye holes. 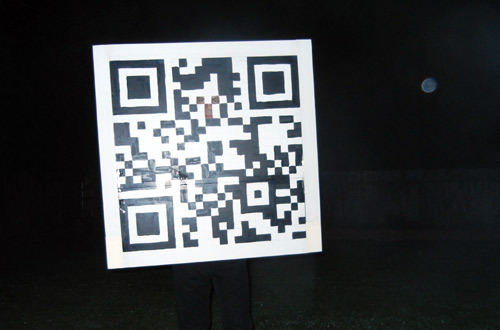 It was great to be able to see through the board, but my nose was still getting smooshed on the costume itself. A few more slices gave me a slot for my nose too. At night, the code was a little harder to read, reducing the maximum read distance from 35 feet down to about 12, depending on the lighting. Now the only question was, should I go to a party or a tech convention?